You're right on the water - make the most of it. Make some headway on your book, looking up occasionally to praise your sand castle builders' progress. Impress the kids with your shot while evening out your tan. Do it up fancy - vacation is a special occasion. Grab pillows and pass the popcorn - the show's about to begin. You're located right on Palm Bay Beach. Dazzling Elizabeth Harbor views and a spectacular white sand beach beckon at the beachfront Hideaways Exuma. Just outside Georgetown along the shoreline of Great Exuma Island, you’ll have access to Palm Bay Beach Club services, from loungers and fresh towels to water sports equipment, a game room, restaurant, and fitness center (if you’re feeling exceptionally motivated). Each inviting residence is individually decorated, perched along the waterfront or poolside, or tucked into the gardens. Cottages have kitchenettes, perfect for low-key meals, but go for a villa if you’re planning on more full-kitchen cooking. The kids will be up early, swimsuits, goggles (and possibly even fins) on, ready to jump into the activities at both freshwater pools or to head for the beach. Paddle kayaks along the shore, try kite-surfing, or crowd into a four-person paddleboat for extra leg-power. Prefer to just relax? Sip a fruity Goombay Smash or refreshing local Kalik beer from the Splash! Bar & Grill, where you can catch live entertainment or gather for big games shown on six flat-screen TVs. The Exuma Cays Tour is a must for wildlife sightings (swimming pigs! ), and snorkeling Thunderball Grotto (as in the James Bond movie of the same name). Keep your binoculars handy – you’ll ride right by private islands owned by Nicolas Cage, Johnny Depp, Faith Hill and Tim McGraw. - The front desk is open 8:00 AM - 9:00 PM daily. Guests that are planning to arrive after 9:00 PM must contact the property in advance using the information on the booking confirmation. 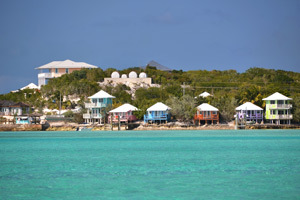 365 islands make up this district, divided into three main areas: Great Exuma, Little Exuma and The Exuma Cays. Exuma is most known for its sapphire-blue waters. Keep an eye out for swimming pigs in the ocean and large iguanas on the beach.